A court in Alexandria has sentenced a group of activists to two years in jail and a LE50,000 fine for organising an unauthorised protest during the Khaled Said trial. Loai Mohamed Abdel-Rahman, Omar Abdel-Aziz Hussein, Islam Mohamed Ahmed, Nasser Abul-Hamed Ibrahim, Hassan Mostafa, Moussa Hussein, Mahinour Hassan El-Siyad and Hassan El-Siyad were convicted of organising an unauthorised protest, blocking the road, assaulting a police officer and destroying a police vehicle on 2 December. They will appeal the verdict, Revolutionary Socialist activist and human rights lawyer Mahinour El-Masry said via Twitter. 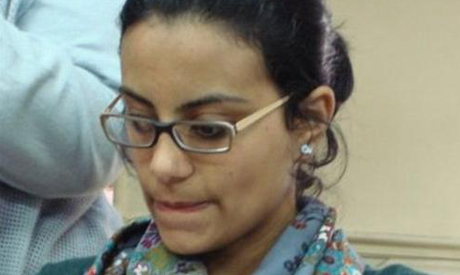 Mahinour El-Masry and Hassan Mostafa are prominent leftist activists in Alexandria. According to reports, the prosecution has ordered the arrest of Mahinour El-Masry, Hassan Mostafa, Moussa Hussein, Mohamed Abdel El-Salem and Hassan El-Siyad. This is another prosecution of non-Islamist activists under the new protest law. On 22 December 2013, a Cairo criminal court sentenced April 6 Youth Movement founders Ahmed Maher and Mohamed Adel, and independent activist Ahmed Douma to three years in jail and a LE50,000 fine for organising an unauthorised protest and attacking security forces outside the Abdeen court in November. The freedom to terrorize is over... I am sure MB terrorists don't like it... Too bad!! Not much the brotherhood terrorists write here, has an ounce of truth. Especially if they claim they are peaceful. Any idiot reading the news around the world knows full well nothing is peaceful about the Muslim brotherhood terrorists. So your terrorist propaganda is falling on deaf ears. I am reading the same article? Not one of these civilians in this article belong to the Muslim Brotherhood. It is sad when mob anger hits the innocent instead of the guilty. It does not matter if you An Islamist or Non-Islamist. If you are protesting without authorization, you are breaking the law. If you want to protest (PEACEFULLY) get your damn permits and protest PEACEFULLY..Don't block the roads, dont assault or destroy property. Get your point(s) heard in the time given and go home. That is how a protest works.. not with violence and always ending in meaningless fighting or deaths.. This is not doing anything to better your country.. its breaking it. Is this what the Coup gained Egypt ? Morsi was far better than this joke Egypt's military stooge government has become. while criminals who killed thousands of people in 2011 and this year are having vacation with state money.